Politiwoops used to be the go-to place to read tweets that politicians thought were clever, before quickly deleting. Twitter cut off the service last year over alleged misuse of its developer platform, but now it’s back, and saving more deleted tweets than ever. In a blog post, the Sunlight Foundation has announced the return, “just in time for the New Hampshire primary,” and presumably all the Twitter shenanigans we can expect. It works like it always has: a feed of all elected officials’ deleted tweets, along with a filter to select by party or state. The only change is the quantity of tweets recorded: in its previous life, Politiwoops had an element of “human curation,” showing only tweets that it deemed important. In the new version, you get the full version of all political missteps, so you can decide for yourself. 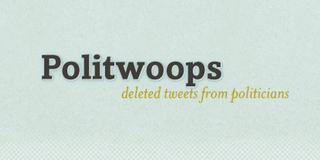 Politiwoops’ takedown last year was due to a disagreement over the use of Twitter’s API. Twitter felt it was a misuse for a service to be recording deleted tweets, and despite Politiwoops’ three years of existence, rescinded its access to Twitter’s API (and therefore Politiwoops’ simple way to record tweets), with no warning and no means of appeal. The Sunlight Foundation seems to have come to an agreement with Twitter, allowing the world to go back to how it should be: Politicians tragically misusing social media, and the rest of us laughing in a publicly recorded way.